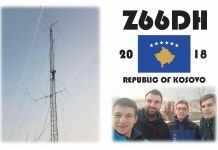 NEWS UPDATE — The Amateur Radio Society of Kosovo, SHRAK, is proud to announce a youth activity in the WPX contest this coming weekend. The youth of Kosovo and Turkey will join to work together and ultimately activate two station as; Z66Y (youth). The operators are Ahmet Bucko, Z63CAB, Donjeta Berisha, Z63DBB, Dardan Bojniku, Z63DBM, Furkan Ozen, TA7AOF and Golkem Cagri Zivali, TA7AZC; all about 20-years of age.